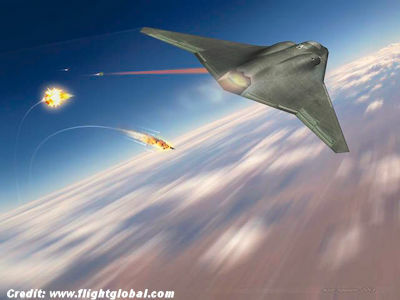 The dawn of the combat laser era might begin in 2021 when the US air force hopes to begin demonstrations of a podded electric laser system for fifth and sixth-generation fighter jets that can destroy incoming missiles, not just steer them off course. Today, the air force research laboratory started gathering market information under an advanced technology demonstration programme known as SHiELD, or self-protect high-energy laser demonstrator. how about using the missing trillions of black budget Dollars on peaceful projects instead? Oh wow, now the kids will have Buck Rogers ray guns to chase fake bad guys and have fun spending endless money! In the meantime, maybe someone should spend some money on the 100 year old low and antiquated road system that is collapsing in this country. Oh gee golly, the little air force boys have a new Buck Rogers death ray gun to play with to shoot make believe bad guys. They have fun spending endless borrowed money, with our name attached to the debt! Maybe someone should think about spending some dollars on the 100 year old, antiquated road system that covers the country and that is collapsing. We don't need ray guns and we don't need more useless weaponry. We need more honest diplomacy...now THERE'S a concept that doesn't cost trillions to us!